The dramatic changes in society, exponential advances in technology and globalization of ‘everything’ are easily recognizable one decade into the 21st Century. The United States is no longer world leader in a global society – not even in education (we are now ‘average’, and rank 25th of 34 in math). Smartphones with 4G wireless data transfer, touch screen and digital video recorder, have made the Jetson’s video phone a reality – and more dramatically – mobile. Tablet devices are replacing laptop computers as the standard mobile computing device for the most continuously connected society in history in a ‘post-PC’ world. Nowhere is change more evident than in the librarian profession. We are; seeing commercial competition for information access and delivery services arise routinely, making ineffective attempts to serve young library customers whose needs we don’t understand, being inundated with technology beyond our capacity to keep pace, while knowing our younger customers are more technologically savvy than we. We are experiencing library closures everywhere and rampant privatization of library management, regardless of our best achievements. Affects on libraries are obviously more than just the bad economy based on daily reports of unforeseen changes in all of the external factors that influence libraries and librarians. There are at least five major challenges that every librarian will face, sooner or later. Whether you overcome these challenges will determine whether you become a 21st Century librarian, and ultimately whether you, your library and your profession survive. The six generations (including that Gen Next of adolescents) that comprise 21st Century library customers create significant differences in library service demands, with the most drastic difference between the Great Generation and the Millennials. This drastic difference creates a heavy demand on librarians to continue traditional library services for some ‘patrons’, while creating new technology-based services for Digital Native ‘customers’. 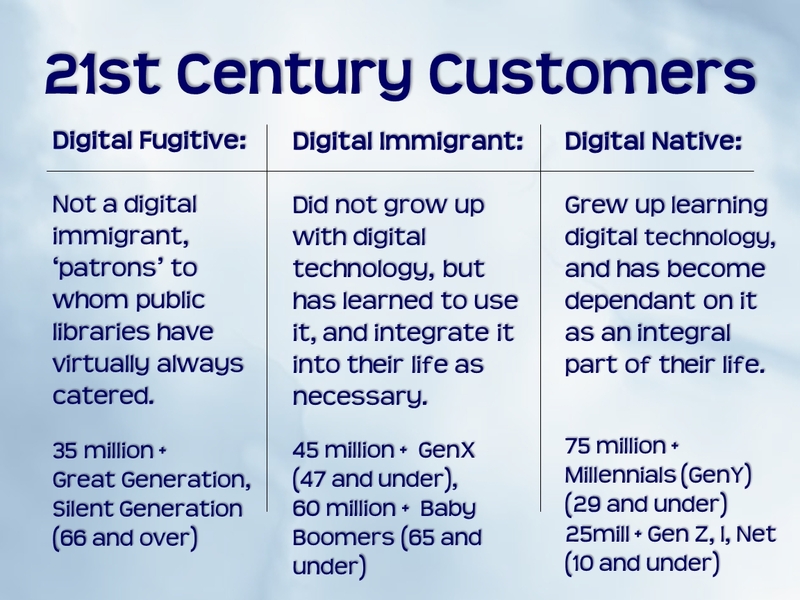 Digital Fugitive and Digital Native customers are at opposite ends of the customer service spectrum, but both deserve excellent library services. The following diagram is a broad generalization of where the generations fall within three types of library customers. The Partnership for 21st Century Skills published its model in 2009, and since then a nationwide movement to reform public education has gained popular appeal. To ensure that future America is capable of participating in the global economy, a major priority is to teach information literacy to young people to be able to use all the technology effectively to access and manage information. The role of librarian as expert researcher handing information to a waiting patron is the antithesis to the collaborative, participative mindset of the emerging Millennial customer. Even Gen Y customers are more technologically literate than most librarians, because the vast majority are Digital Natives, but very few of them are pursuing a career in librarianship. In order to prepare for the increasingly more information literate Millennial customer, librarians need to become guides for information literate participants. In June, 2010 the New York Times published an article about IBM’s new super “answering” computer called Watson. For the last three years, I.B.M. scientists have been developing what they expect will be the world’s most advanced “question answering” machine, able to understand a question posed in everyday human elocution — “natural language,” as computer scientists call it — and respond with a precise, factual answer. In other words, it must do more than what search engines like Google and Bing do, which is merely point to a document where you might find the answer. It has to pluck out the correct answer itself. … With Watson, I.B.M. claims it has cracked the problem. Will the reference librarian become obsolete? It will be up to them NOT TO. Because digital media providers, like industry leader Overdrive, provide greater access to eBooks, audio books, music, and video (over 300,000 titles) than your local library can afford to offer from its own collection, traditional circulation is being overshadowed by electronic formats. “OverDrive has developed custom download websites – or ‘Virtual Branches’ because they look and feel like one of your [library] branches – for 10,000 libraries worldwide.”, because Millennial library customers prefer to access rather than own, so digital media is only going to become more available. Alarming news of the California governor’s proposal to cut over $30M in funding for the state’s libraries, staggering news of award winning Public Library of Charlotte & Mecklenburg County cutting $17M from their 2010-11 budget that forced the lay-off of dozens of staff, and more local library closures in 2010 than anyone cared to count, bring a frightening issue to the forefront of our professional concerns – the role of the library in the 21st Century! Can or should libraries try to compete with commercial information providers like Google, Netflix and Amazon? Can or should libraries try to compete with digital technologies like smartphones, tablets, and geosocial networking? How does the library retain it’s relevance in its local community that is a part of a global community? Both Leonard Kniffel, long time Editor and Publisher of American Libraries, and former ALA President Roberta Stevens have acknowledged that the major question of the 21st Century that they are most often asked is; “Why do we still need libraries?”. They both also express exasperation from being asked that question routinely, which makes one wonder if the profession has any adequate answer. What can libraries do to remain relevant in their communities in the 21st Century environment – except become 21st Century libraries? 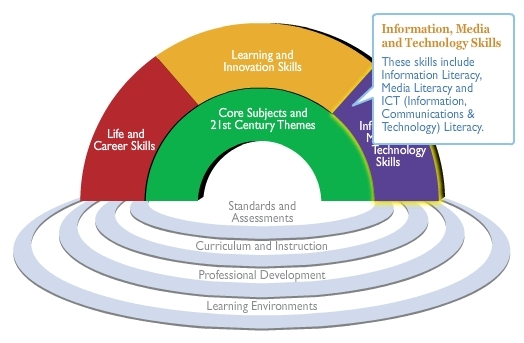 When one considers all the evidence of advancing technology, education reform, societal changes, information literate customers, and globalization of ‘everything’ and their impact on librarianship and libraries, it is crystal clear that 21st Century librarianship MUST BE drastically different from all previous concepts of librarianship. It requires a professional who embraces the potential of technology, creatively finds appropriate ways to implement it into library services, and one who has more diverse – even ‘unconventional’ – skills than ever before. The 21st Century Librarian is a professional who understands the Millennial library customer, is able to adapt existing services and create new ones to meet their community’s needs, and change the public perception of “library”. The future of librarians as information providers is not in a dazzling building, but in the world of cyberspace that resides in the hand-held devices of most library customers, and as an indispensable partner in the local and world communities. Generation Next adults will only access information on their mobile devices, and they will have information literacy skills far beyond any previous generation while living in local communities that are becoming more focused on global issues. Librarians must both catch a vision of the 21st Century Library and Librarianship, as well as achieve them before 2020, or the local library will either be extinct, a reliquary, or simply a community civic center, with no librarians. In this Century of change, only 21st Century Librarians can create a 21st Century Library! As we all should be. Regrettably, I think live story time will become a novelty at the local public library, simply because it will be so different from the other forms of exposure that children have to stories and reading. It will likely be the parents who appreciated story time when they were young who actually bring their children to the library. Over time the numbers of participants will continue to dwindle until it becomes even more of a novelty and eventually becomes extinct. “Progress” does that to society – regrettably. I ‘m trying to figure out why libraries don’t have reader online forums on their websites. It seems pretty obvious that’s what you can do to facilitate discussion, find out what readers want and encourage people to connect with each other in their communities, perhaps teach online literature or local history courses using key books.. this could work particularly cities with many branches..and now that many people are familiar with going online for information. Sites like amazon have reviews, recommendations and lists, shelfari has groups, as does good reads but they lack a community feeling of common interests you’d get from being on forums. Why arent librarians facilitating these? They can’t be too hard to set up and customise with the software available. Instead libraries are just copying business marketing using Facebook, twitter, and one topic specialist blogs bemoaning the state of libraries, maybe the odd book review here and there….online reader communities should be popping up everywhere ever since libraries went online… But I’ve yet to see it happen. Well, as noted previously, every library system is different, and many do have reader advisories. They are not at all uncommon. Have you searched for systems that are using them? I know of at least one in my state. I haven’t seen any linked to any library after much searching. If you know of any and have a link, that would be great. Blogs don’t count. Through a Google search using “public library readers advisory” I found many links. Maybe they aren’t the readers advisory as you understand it, but things always change. Brigham City (UT) Public Library has a very good advisory for a small community. I think RA is still alive and well.